The confetti snowflakes were a great find. I was looking for silver snowflakes to complement my snowflake theme for a bridal shower. I used the snowflakes to add sparkle to a larger white paper snowflake by taping them to the center of the larger snowflake. It was a classy addition to my snowflake decor. Q:My question is regarding the silver sparkle snowflake confetti. The price says $3.50 per set of 12. Is this 12 bags? If so, what size are the bags? Thank you. 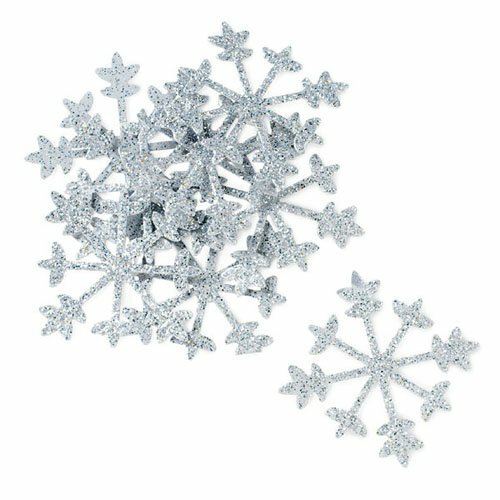 A:For this item, there are 12 individual snowflakes per set. $3.50 is the cost of 12 individual snowflakes.